We had to bring our balcony plants back in. The broccoli-rahb and spinach seeds are under row cover. It got as low as 18, and I fear frost damage when we finally look at it tomorrow. The chickens ate all the lettuce in the garden, and we ate some more chickens, so no frost damage there. The peas are coming up nicely and we’ll see soon if the onion seeds I planted make it. 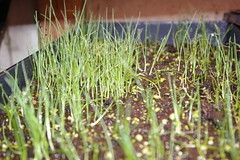 We do have flats of onions and leeks under lights just waiting for planting weather. The tomatoes are up in the basement, and the first few peppers. Both are last year’s seeds, which doesn’t seem to have bothered the tomatoes. We’ll see about the peppers. We had eleven lambs from seven ewes, only three white. The two hoggets and June (who is nine years old) had singles, with four sets of twins. We have forbidden them all to die. Having Birch as the ram sure shows this year. So much color, so much spotty flashy patterns, with blazes and different colors on feet and tails. 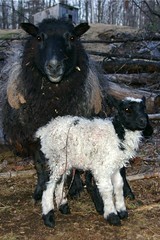 An all black ewe lamb from Venus and a moorit ewe lamb from Selina. No horned girls, though, unfortunately. I put 150 mixed eggs (Icelandic chickens, Saxony ducks, Midget White turkeys) in the incubator two weeks ago, but skipped last week, when it got down to 18. Goose eggs need a special tray in the big incubator, so I have 9 of them in the little Brinsea. There are three geese and a couple of turkeys setting already. We’ll see how that turns out. I had to put most of the geese out on pasture sooner than was good for the pasture to keep the ganders from killing toms and drakes that wandered to close to the setting geese like happened last year. They have been quantum mechanically tunneling back through the fence, but so far haven’t been jerks again, so I’ve let them stay. Bird grain consumption is down by half, as usual. Actually a little better than usual. It usually falls when the snow melts, then rises again until green up. This year it hasn’t really gone back up. The ducks seem to be the limiting factor. The chickens would rather forage, the turkeys and geese would just as soon forage, but the ducks totally want their pellets every morning, no matter how much grass and bugs are available. The sheep are starting to think the grass is greener on the other side of the fence. It’s not, but I’ll reinforce the fence anyway. There’s also still one spot in the back paddock in need of serious repair where hurricane Irene dropped a tree on the fence, but I don’t want them back there for a few weeks yet anyway. So the whole Spring! Now! excitement was great, but it’s actually kind of nice to have an extra two weeks for spring clean up and fix up before we have to get seeds in the ground or sheep on pasture. This entry was posted in Broccoli, Ewes, Lambs, Lettuce, Onions, Peas, Sheep. Bookmark the permalink. Post a comment or leave a trackback: Trackback URL.